A prior tennant left the GT Outpost mountain bike that Morgan rides. Where are you going? I am heading back home from the grocery store. Why ride? Especially when I have things to carry, I would much rather bike somewhere than walk. And it's a great way to see more of the city on my own terms. Favorite ride? I haven't been out much because I've only been in Chicago for a month. But so far, my favorite ride is just exploring my new neighborhood and getting to know it as much as I can. While riding you …? ... like to be safe! City biking makes me a little nervous, especially when the curbs are almost as high as my knees like some places in Chicago I've seen. Next thing on my wish list is a good (and cute?) helmet. 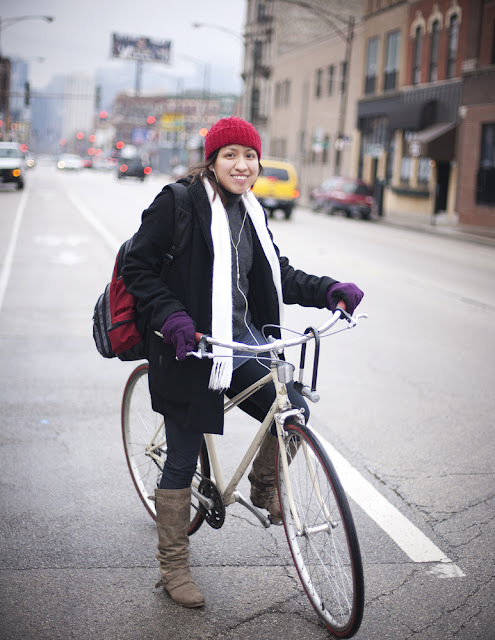 How can Chicago improve bike infrastructure or make Chicago more bike friendly? I lived in Munich last summer and the BEST thing for bikers there were the bike lanes. They had them on roads or to one side of sidewalks, and people followed them! They were also pretty strict about bikers following the same rules as cars, like stopping for red lights and staying in lanes - and cars had to do the same and watch out for bikers as well. And other cool, funny tips or stories? When you lock your bike, leave it in a semi-public place. Most regular locks are pretty easy to break with a hammer, and if nobody is there to see it, it's even easier! I know because my bike got stolen from a basement parking garage while locked up, and I had to break my current bike's lock because the last owner couldn't remember the code. That's enough breaking of locks for my lifetime, thank you very much. On to those crazy U-locks for me! Chicago in the spring can be challenging (though it has been unseasonably warm). This season brings the weather man's credibility to the level of the psychics and tea-leaf readers. Case in point: I was planning to post this today because it was supposed to be rainy, but now it says clear skies the whole the day (not that I am complaining). My ABSOLUTE least favorite weather condition is rain, specifically cold rain, and I have been looking for ways to cheer myself up while riding in it other than my normal use of positive self deception (i.e. the rain make my skin look fresh and dewy, or rain water does wonders for my hair). My quest has been to find the the perfect rain trench because hopping on my bike, wearing a bright rain coat, is a perfect antidote to rainy day doldrums. I was thrilled when I found this Happy Rainy Days trench on the site Cycle Style. (thanks Mary for the Christmas gift!). I also love my Saltwater sandals which are built to withstand any amount of water. I just found out that the Happy Rainy Day brand has United States distribution on the site Hip in the Rain, so check it out. 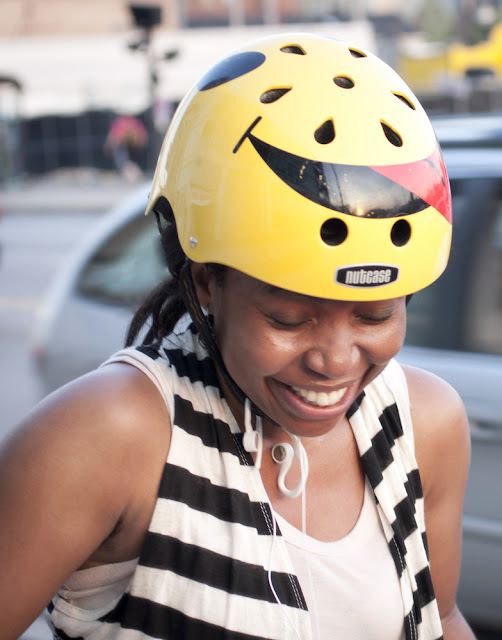 My bright yellow Nutcase helmet, I got from Amazon.com last December for about $19. My tops I got from Mjrsales.com last February. 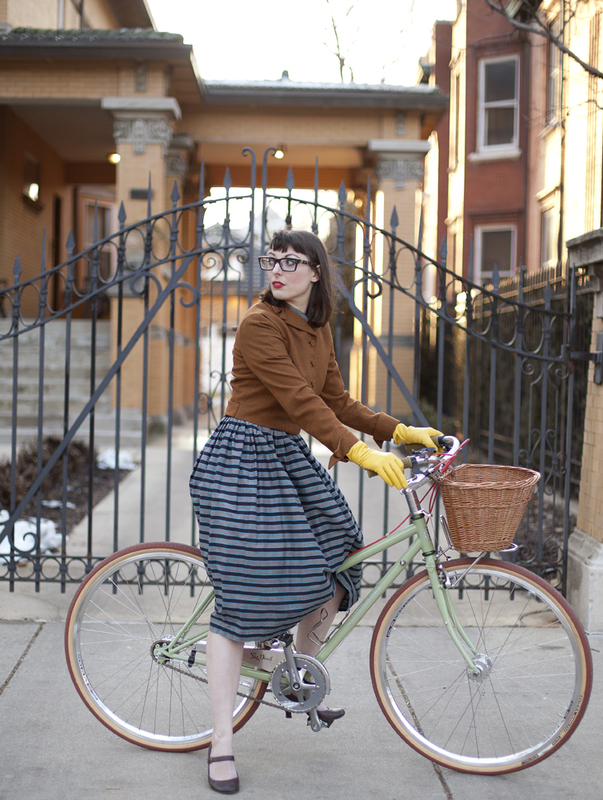 The skirt, I picked up at local Good Will store some years ago, is particularly comfortable and great for riding. And my smeakers (lol) I got a couple of years ago from Walmart for about $5 (was on sale). They so comfortable and great for the ride. Tell me about your bike, and where you got it? My lovely bike is a Schwinn Surburban, 1989 model. I drove more than 30 minutes outside the city to get this bike. I fell in love with it as soon as I saw the picture and the price was awesome, just a $100 bucks. But the bike has more than proven it was built well. I have been riding it for about 1 year, and have had no major issues with it. I rode this bike all through last winter and I can definitely say it is a great road bike. Excluding the wheels(rims and wheels) the bike still has its original parts. I have covered more than 10,000(average 40 miles a week) miles with this bike since I purchased it, and it still runs WELL. On my way back from school. Riding is a great way to get A MUCH needed exercise, loosen my muscles, and de-stress. It is also a good way to clean out my lungs if the weather permits. Best of all, it is a great way to get around the city, in good time, and never needing to worry much about parking or the crazy Chicago traffic. I truly enjoy riding every where I can, whether I am running errands, hanging out, or riding to school and church. Just having that me time on my bike is a great way for me to relax, and declutter my mind. While riding you …? I enjoy the Chicago breeze on my face, as I listen to my fm radio which I have clipped to the front of my bike, while I ride. How can Chicago improve bike infrastructure or make Chicago more bike friendly? Chicago could do a better job of fixing the roads. I love to ride my bike, especially with the great weather we have been having , but the bumps, and potholes on the roads are hard to deal with. It is just not cool riding over those bumps, potholes and cracks in the road. It makes riding a bit painful, especially if you do not see the crack, or have no option but to ride over them. And other cool, funny tips or stories? Riding through winter weather is not as hard as it may seem. Hues brand sweater leggings are really warm, and a great way to stay warm and stylish on the seriously cold winter days when you ride. I would wear two pairs, along with two pair of gloves to keep me warm on those really cold days. Tell me more about your bike, and where you got it? 1986 blue Schwinn Traveler Mixte from Craig's List, refashioned by myself with sparrow handlebars, blue butterfly springer seat and rack. It's name is Swifty Blue Butterfly, but I call her Swifty for short. Where are you going? Heading home from work. Why ride? I love to ride and its the only way I know to have fun and get some exercise at the same time. I also hate crowded trains and buses and I can get to my destination faster and more reliably than if I would drive or take public transportation. I am always on time when I am biking. Favorite ride? Riding the North Channel Trail through the Skokie Sculpture park and the Lake Front Trail in the mornings when it is less crowded. I also love to just ride late at night or really early in the morning when it is pretty and peaceful on the streets. While riding you …? I sing weird and off-beat tunes out loud, usually relating to whatever the weather is like. For example "I'm only happy when it rains" when it is raining, and "it's a beautiful morning" on those types of days. 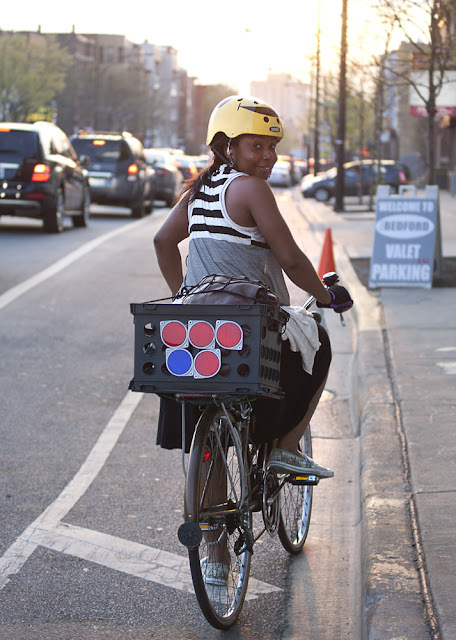 How can Chicago improve bike infrastructure or make Chicago more bike friendly? I would love to see Chicago actually fix many of the bike lanes that are deeply pot-holed and maybe distinguish the bike lanes with high-visibility paint so drivers understand they are not passing lanes. I would love to see signs on street posts and parking meter payboxes that tells driver's to look for bikes before they open their doors into traffic, too. And other cool, funny tips or stories? On our wedding day/night, we were married in the morning, had our reception in the afternoon, and then took our tandem bike to meet a group of friends to go out riding- my husband in a tux and I in a short wedding dress, on the tandem. It was exhausting but wonderful, and we did it in November! As far as tips go, I would say you can ride in any type of weather if you prepare for it. Rain, sleet, snow, heat, it really isn't a issue as long as you dress appropriately and ride safely and are aware of your surroundings. I ride year round and I love it. On the other hand, I also believe that if you are uncomfortable riding in certain weather conditions, it is fine to skip riding that day and shouldn't feel pressured by your riding friends to ride. 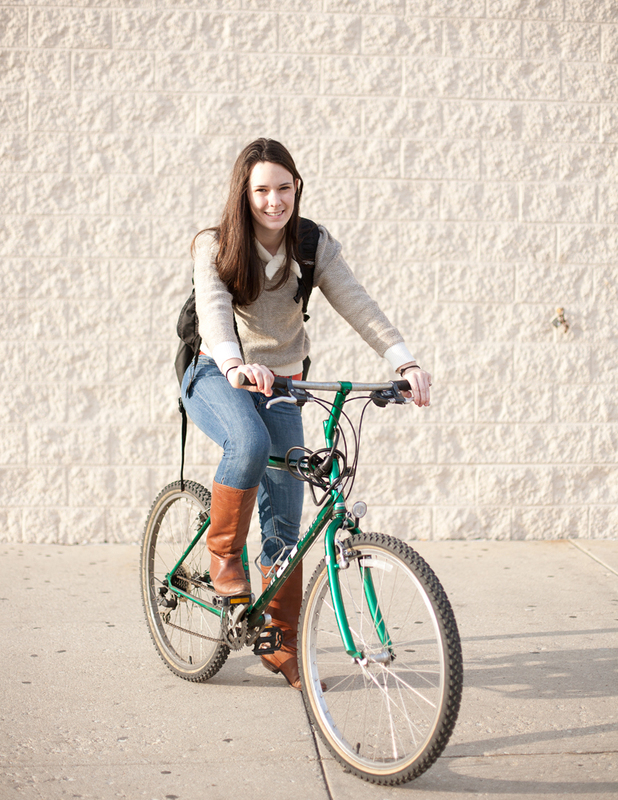 Riding should be fun, and you should enjoy it, whether it is just for transportation or recreation. Amanda rides a Nottingham mixte rebuilt by Sascha Skolnik. Tell me about your bike, and where you got it? Sascha Skolnik built it from old Nottingham bike frame imported from UK and painted it beige to match handles, and tires. What are you wearing? Braetan wool coat, Steve Madden boots, Ralph Lauren gray cashmere turtleneck, everything else is Target. Why ride? I have always lived in big cities (Chicago, New York, Berlin) and driving never really came up. I don't fancy suburbs. While riding you …? Secretly curse at drivers who honk despite my well-informed biking style. How can Chicago improve bike infrastructure and make Chicago more bike friendly? First bikers need to gain respect by not running red lights ever. And other cool, funny tips or stories? There is a guy in long dreadlocks who bikes in Logan square and bucktown, dunno his name but I always see him riding different bikes that reach higher than most cars on road.The bikes are always amazing. Last weekend I had a blast working with Holly Rhode of the impeccable vintage clothing site www.lucitebox.com, Hair and Make up artist Christopher Conner, and these fine cycling ladies: Liz, Dottie, Ash, Lisa, and Kim. We worked on some photos to publicize the upcoming Bike Winter Fashion Show, and thanks to all of these ladies (and one gentleman), I think they turned out great! 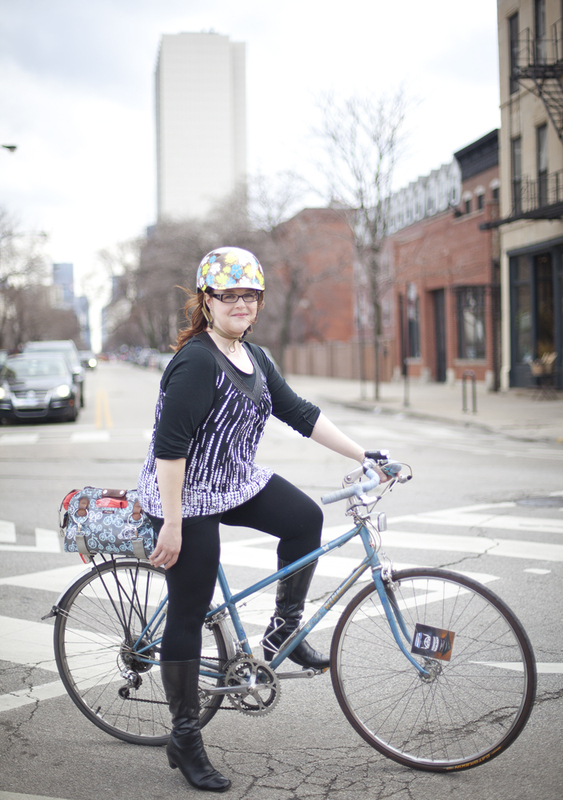 You might recognize Dottie from her blog Lets Go Ride a Bike, or from one of my photos here. 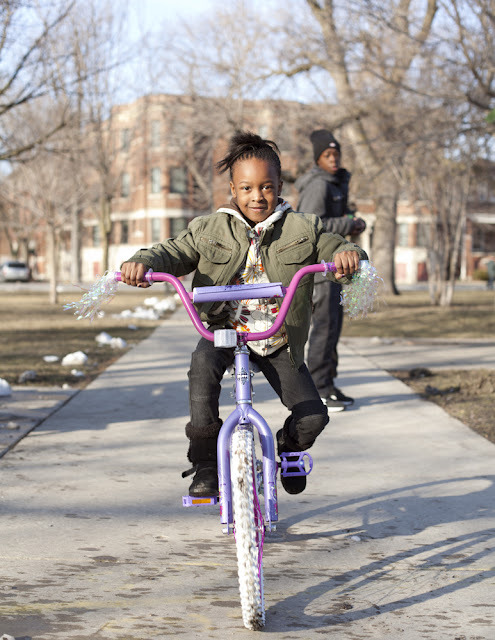 Both Liz and Kim are involved with West Town Bikes the non-profit community bike shop that focuses on under-served populations and youth programing. Ash organizes the group rides Chicago Kidical Mass and Critical Lass, and has a blog about family cycling called One Less Mini Van. Lisa is very involved in the cycling community and I randomly photographed her and family here. What a great group of ladies to represent the cycling community. Thanks to Boulevard Bikes for lending us all of these amazing bicycles for the photo shoot. P.S. Of course I couldn't leave Holly's without picking on some funky vintage duds. Check out the amazing graphic print dress I bought. It fits perfectly! I'll have to post a photo of dress + bike very soon. Liz of West Town Bikes on an orange Hot Rod bike from Boulevard Bikes. Dottie of Lets Go Ride a Bike on a blue Pashley Princess from Boulevard Bikes. Ash on a olive green Handsom Cycles she-devil mixte from Boulevard Bikes. 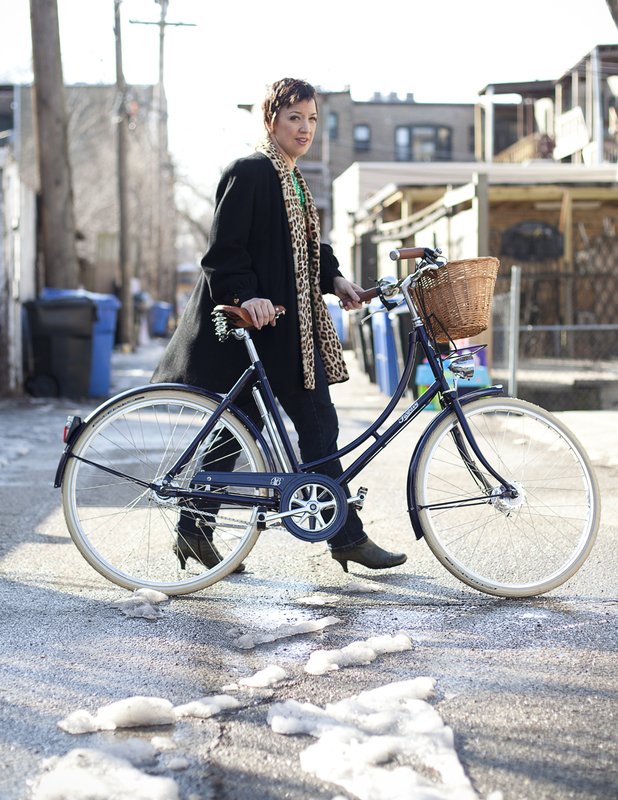 Kim of West Town Bikes on a olive green Handsom Cycles she-devil mixte from Boulevard Bikes. Phew, can't believe I haven't posted since Friday. I've actually been sitting on a bunch of photos, but I've been too busy to edit them! Some fun upcoming stuff: I shot the promo photos for the Bike Winter Fashion show. I'll be posting photos soon, but I just wanted to show this outtake. While photographing the Bike Winter ladies in the park, I spied this little lady riding like the training wheels came off that day. I snapped a few photos, but unfortunately I didn't have a pen to right down her mom's info. Is it too late to bring back handlebar tassels?